Following an exciting spring season, local slam poetry group Urban Legends has narrowed the field to eight. This event sees Synonymous, Mack Cannon, Hyfidelik the Gypsy Sun, Prufrock Shadowrunner, Brad Morden, Just Jamaal, Khadija, and Sarah Musa compete for a spot on the team’s roster at the Canadian Festival of Spoken Word later this year. Come enjoy the booming proclamations, the insights, and the imagery of Urban Legends as they perform on a larger stage for the first time. Friday, July 15. Doors open at 6:30 p.m. for drumming and drinks; performance 7 p.m. $10. Irving Greenberg Theatre Centre, 1233 Wellington St. W. For full event details, see Facebook event page. Lots of fun to be had at the H.O.P.E. 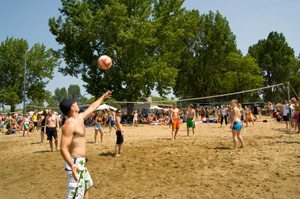 Volleyball Summerfest. Photo courtesy Ottawa Tourism. Ottawa-born comic John Hastings records his first DVD this weekend — and he’s inviting hecklers! But seriously, folks, wouldn’t it be cool to be a part of the career of an up-and-coming stand-up comedian? One who started his career doing improv at Nepean High School? Working in Montreal for the past five years, Hastings has been nominated twice as the XM Canada’s Next Top Comedian — in fact, he’s the only person to be nominated twice — and won the Just For Laughs Homegrown Comedy Competition last year. Plus, all audience members who attend will receive a two for one voucher for a future Yuk Yuk’s show. Friday, July 15 and Saturday, July 16. 9 p.m. $20. Yuk Yuk’s @ The Prescott, 379 Preston St. www.yukyuks.com.